On Friday, NASA announced it would not fly astronauts during the Space Launch System's maiden mission, ending a short-lived consideration to repeat the space shuttle's bold 1981 test flight. At the same time, agency officials confirmed what we already knew: SLS and Orion will not be ready to fly in 2018 as previously scheduled. The flight will instead occur in 2019, but no firm date has been scheduled. That's a cumulative slip of up to two years since the rocket was unveiled in 2011. Though the rocket has yet to leave the pad, it's been a wild ride for what will eventually become NASA's first new crew vehicle in almost four decades. Last year, we chronicled the story of SLS and Orion in our Horizon Goal series, and checked in on the programs' development during our 10-day Rocket Road Trip through the Southern U.S. For this latest addition to the story, I compiled a timeline of the major twists and turns SLS and Orion have taken as they attempt to send humans beyond low-Earth orbit for the first time since 1972. Members of Congress and NASA Administrator Charles Bolden unveil the Space Launch System design in September 2011. From left: Sen. Kay Bailey Hutchison R-Texas, Sen. John Boozman, R-Ark., Sen. Bill Nelson, D-Fla., Rep. Chaka Fattah, D-Pa., Administrator Bolden. President Obama signs the NASA Authorization Act of 2010 into law. 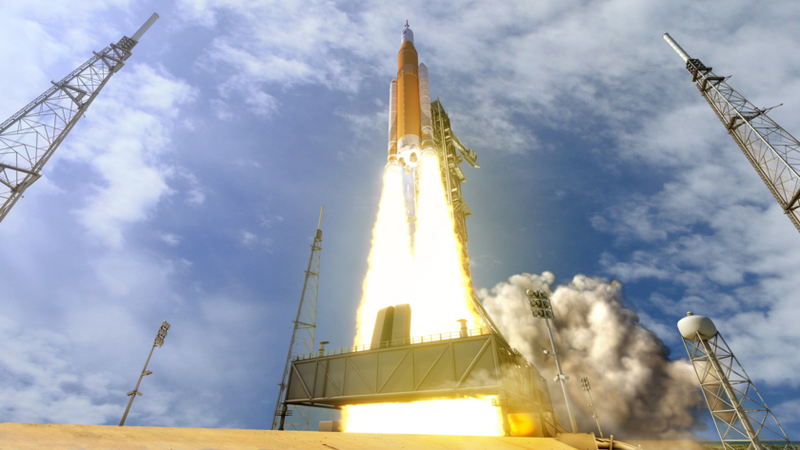 The bill directs NASA to create the Space Launch System, an Ares V-like rocket with an initial capability of 70 tons, increasing to 130 tons after future upgrades. An operational date for the core vehicle is requested for December 31, 2016. 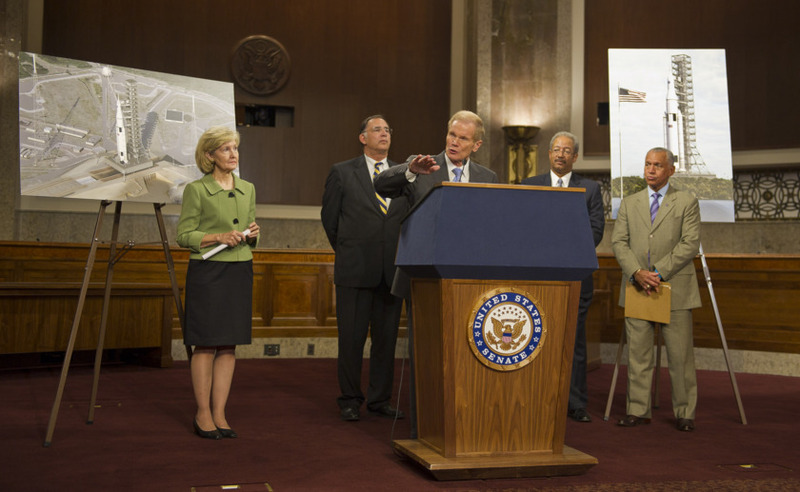 On Capitol Hill, Florida Congressman Bill Nelson reveals the design of the Space Launch System. "We're about to—the administrator of NASA, Charlie Bolden, is about to—announce the most powerful rocket in history," said Nelson, as Bolden waited for his turn to speak. Bill Gerstenmaier, then the director of NASA's space operations directorate, said a test flight would occur at the end of 2017. Internal and external audits estimated a development cost of $18 billion through that mission, including Orion and ground systems infrastructure. NASA announces the European Space Agency will provide Orion's service module, which provides the capsule with power and propulsion. Later that year, reports surface that the service module is facing mass challenges and other technical problems. But in January 2014, ESA insists the module will be ready for the first flight in 2017. NASA announces SLS has passed its KDP-C milestone, which locks in a baseline launch date of no later than November 2018. The agency says it will continue to work toward a launch date of December 2017. At the Michoud Assembly Facility in New Orleans, Louisiana, the Vertical Assembly Center, which is used to weld SLS fuel tanks, opens for business. But a tower misalignment is soon discovered, prompting repairs and contributing to an internal SLS launch date slip from December 2017 to July 2018. 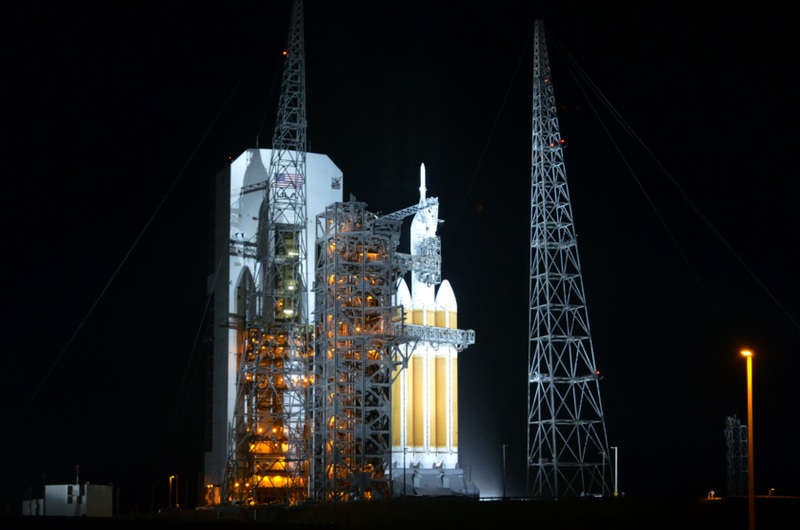 The first Orion spacecraft completes a successful four-and-a-half hour test flight atop a Delta IV Heavy rocket. Around the same time, NASA and ESA officials report continuing challenges with the Orion service module mean the capsule will not be ready in 2017 as previously hoped. A Government Accountability Office report says the Space Launch System is quickly running out of schedule margin to meet its November 2018 launch date. NASA announces Orion has passed KDP-C, which locks in a baseline crewed flight test date of no later than April 2023—a potential slip of two years from previous estimates. The Planetary Society checks in on SLS and Orion progress during our 10-day Rocket Road Trip to NASA centers and contractors across the Southern U.S. We noted that despite an impressive amount of infrastructure upgrades at places like Kennedy Space Center and the Michoud Assembly Facility, the rocket's schedule margin appeared to be razor-thin. A tornado hits the Michoud Assembly Facility, damaging an estimated half of NASA's facilities. SLS hardware is unharmed, but the disruption to operations is significant. NASA announces it is studying adding crew to the first SLS-Orion flight. A NASA Office of Inspector General report warns that SLS, Orion and ground systems are effectively out of cost and schedule margin. The report also reveals NASA and Boeing were forced to change the way the rocket's liquid oxygen tanks are welded together, causing more delays. A GAO report says the first SLS-Orion flight will be delayed, regardless of whether or not a crew is added. In the report, NASA concurs with the finding. During a press call with reporters, NASA says it will not place crew aboard the first SLS-Orion mission, but nevertheless, the first flight has slipped to 2019. No firm launch date has been set. It just goes to show, the cancellation of the Ares/constellation project was a horrible idea. The concept was good, the technology there, and they had already had at least one launch. We'd have been back to the Moon by now. The timeline needs expansion - these events were a big part of SLS's evolution: * 2003 - Columbia breaks apart over Texas, spurring rounds and rounds of ideas and plans of what to do instead * 2004 - the president announces a Vision for Space Exploration, which would come to mean (short term) finish the ISS, (medium term) replace the Shuttle while reusing most of the components in order to save R&D time and cost, and (long term) move on to the Moon, Mars, and beyond * 2006 to 2009 - the US legislature changes parties, the wars in Iraq and Afghanistan continue to consume national treasure and attention, the economy nosedives, and the Constellation program quagmires, and a new president takes the helm * 2010 - new president announces a new plan: SLS In the meantime, I can't help but compare the past 7 years to the 1960s. SLS was announced in 2010, and in the 7 years after that we've seen ... one launch, testing some components? 2 launches? I don't even know, even though I try to follow space activity closely. Very little apparent progress. Kennedy's speech at Rice was in 1962, and in the 7 years after that there were ... dozens of launches in 3 separate manned programs - several launches every single year - capped by the actual Apollo landings. Why is it a half-century ago we could spend 7 years doing launch after launch after launch and finally mission success, whereas now in 7 years, we have excuse after excuse after excuse? Sure, NASA in the 1960's had more money, but NASA in the 2010's has the already-existing technology. Saturn V is still around. External tank, SRB's, still here. Hell, SLS (and Constellation from whence it came) was sold to the public as being the "easy" route because it was going to re-use and tweak already-existing hardware up and down the stack. Reality not lived up to the promises. Ares and SLS are (intentionally) very similar in most key ways. Ares development fed directly into SLS development (and both started with Shuttle components as their starting points), they didn't throw away the Ares plans and start SLS totally from scratch. So there's a not-insane argument to be made that cancelling Constellation did very little to really cancel Ares, it just changed the name and a bit of the general layout. And if that's true, then Ares V would likely also not yet be ready to fly by now, because it would have run into almost identical limits. (Maybe Orion-Ares I would be up by now, but at the expense of uncrewed cargo launches and/or commercial crew vehicle development. There are always trade-offs.) Anyone insisting that they know the one true best way to get things into space has either spent too much time or not enough time playing Kerbal Space Program. And I often get the impression that when Americans in particular debate spacecraft production, they're really just using that as a not-too-subtle cover for arguing personal political agendas. And that's ok, but we'd all save a lot of time if they were more honest about it. It's true - I'm suspicious of both parties, and pretty much anyone elected president. Perhaps this timeline will help elaborate on my frustration: THEN 1962 - (Feb) John Glenn, 1st American in space, part of Project Mercury ... 2 other manned Mercury missions ... (Oct) Kennedy promises to send people to the Moon and back within 7 years 1963 - 1 manned Mercury mission 1964 - 1 unmanned Gemini mission 1965 - 1 unmanned Gemini mission ... 5 manned missions 1966 - 5 manned Gemini missions ... 3 unmanned Apollo missions 1967 - 1 unmanned Apollo mission ... 1 manned Apollo mission 1968 - 2 unmanned Apollo missions ... 2 manned Apollo missions 1969 - 4 manned Apollo missions, including lunar approach and then 2 landings 1970 - 1 manned Apollo mission, landing on the Moon 1971 - 2 manned Apollo missions, landing on the Moon 1972 - 2 manned Apollo missions, landing on the Moon (about 50 years pass in between) NOW 2010 - Obama announces SLS program 2011 - final launch of the Space Shuttle 2012 - ... 2013 - ... 2014 - 1st unmanned test-flight of Orion MPCV (on Delta IV Heavy), to Earth's orbit and back, similar to Apollo 4 mission of 1967 2015 - ... 2016 - ... 2017 - ... 2018 - ... 2019 - 2nd unmanned test-flight of Orion, to the Moon's orbit and back 2020 - ... 2021 or maybe 2022 or maybe 2023 - first manned Orion mission, to the Moon's orbit and back Kennedy announced we'll send humans to the moon, and less than 7 years later we did ... 3 programs spanning 11 years sent 31 manned and unmanned missions to space, ~ 1/3 to the Moon and back. Obama (and Bush before him) announced a return to cis-lunar space, and ... one test flight a few years later, and ... hopefully another test flight 5 years after that, and ... one manned flight maybe 3 or 4 or 5 years after that. Literally the USA predicted and then accomplished something in 7 years (1962-1969); while we're struggling to hit an easier target in more than 10 years (2011-2021). 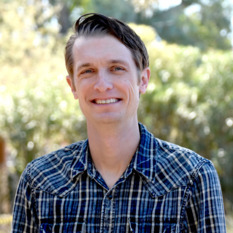 Hi Jason; I just finished listening to the new (last week of May 2017) episode of the SETI radio podcast Big Science called the Crater Good. This program was about efforts of many space powers especially China and Europe to return to the Moon including with astronauts and the lack of such plans by United States and NASA. In part of the program they mentioned that from about 2010 or 2012 I don't remember which year it was determined it wouldn't be practical or desirable economically or politically to go back with astronauts to the Moon (or to the surface of Mars) because it would be too expensive to develop and use a lander or descent/ascent module. Is this true? How much would it cost to develop and then use each additional lunar descent/ascent module? How would these costs compare to the costs of developing and using each additional SLS rocket or Orion crew section which are being mostly covered by the current budget? It seems to me that although a lunar lander or descent/ascent vehicle might be more complex and more expensive pound for pound or kilogram for kilogram than the SLS it would still be much cheaper since the SLS is so much larger and more massive. And if money can be found for SLS and Orion why can't money be found for a lunar and perhaps eventual Mars surface descent/ascent module especially when I think NASA is saving money in replacing the Space Shuttle with the commercial cargo missions including soon commercial crew missions that should be more cost effective with commercial competition. I heard SLS called a rocket to nowhere and they did mention on the SETI episode that NASA in this 2010 or 2012 space policy decision found too costly to develop a lander for a substantially massive astronomical body like the Moon or Mars rather than a small light gravity asteroid and that this was why NASA abandoned returning astronauts to lunar surface. Is this true? What could be done to reduce lunar lander costs to start human lunar surface base missions?